Police arrested three men, aged 17, 18 and 21, for assault after officers were called to a house near Inveraray at 9pm on Monday November 19. The men were held for court and a report on the assault on two other men was sent to the procurator fiscal. 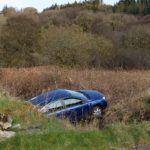 A woman aged 56 was charged with careless driving after a Renault Clio and a large goods vehicle collied on the A83 near Tarbert on Tuesday November 20 at 3pm. The woman suffered slight injuries and was issued with a £100 fixed penalty ticket and three penalty points. The driver’s side mirror of a black Volkswagen Amarok pick-up was damaged when it was hit by another vehicle, possibly a Ford Transit van, on Thursday November 22 on the Oban Road, Lochgilphead, between 1pm and 3pm. The suspect vehicle which failed to stop and report the incident. Police are investigating. At 6pm on Thursday November 22, a 25-year-old man and a 42-year-old woman were stopped and searched by police and found in possession of cannabis at Kennacraig Ferry Terminal. Both were charged and a report will be submitted to the procurator fiscal. Glue was poured over two cars on Manse Brae, Lochgilphead, sometime between 3pm and 9pm on Thursday November 22. Police are investigating. 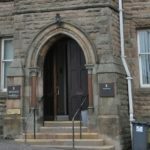 A man, aged 41, was arrested for behaving in an abusive manner at 6pm on Friday November 23, in Harbour Street, Tarbert. The man was charged and issued with a £40 fixed penalty notice. A motorist was stopped for speeding on the A83, near Lochgilphead High School, on Saturday November 24 at 10am. The driver, a man aged 38, was given a £100 fixed penalty ticket three penalty points on his licence. A 39-year-old man was arrested for drink driving on Sunday November 25, at 2am on Lochnell Street, Lochgilphead. The man subsequently failed to provide a breath specimen at the police station. He was charged, held for court and a report has been submitted to the procurator fiscal. Sometime between 10pm on Saturday November 24 and 11pm on Sunday November 25, in the grounds of the old primary school, Whitegates Road, Lochgilphead, the windscreen of a white Ford Mondeo was smashed and the wing mirrors and rear wiper removed. Police are investigating. Anyone with information in relation to the above, or to any incident, should contact their local police office on telephone number 101, or anonymously through Crimestoppers on 0800 555111.